Discrete phono stage for moving coil and moving magnet cartridges in its own shielded case. its very first product was a high-quality preamplifier designed to make the most of the then-new LP record format. And with a history stretching all the way to that ground-breaking Audio Consolette – which Saul B Marantz started manufacturing in 1952, and which soon became the first real Marantz product, the Model 1 preamplifier – , it’s no surprise that the company’s very latest Premium Series model, the PM-10, is an integrated amplifier built to set new standards with all of today’s music formats. In fact, this massively powerful integrated amplifier is constructed more like a high-end separate preamplifier and a pair of monobloc power amps, but all in one beautifully finished case, designed both to maximise performance and create a strong visual statement. Making an integrated amplifier with dual monobloc design fitting in a normal size cabinet is made possible by the use of a stereo switching amplifier. Its aim? To reveal the maximum musical involvement from everything from LPs to the latest high-resolution audio files and beyond, and with all the power and control required to drive the most demanding loudspeakers, allowing them to perform at their best. To achieve such quality, while still delivering class-leading power, means optimising each section of the amplifier for its task, just as would be done in a design using a separate preamplifier and monobloc power amps. Commonly, amplifiers use a single transformer, with separate power supply regulation for the preamplifier and power amplifier sections; the PM-10 takes things much further. 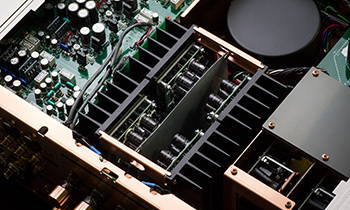 A dual-mono design, it has separate power supplies for the preamplifier and each of the power amplifier channels, with one transformer dedicated to the preamp to ensure the delicate signals passing through that section of the amplifier aren’t affected by the demands of the high power output stages. There’s also a dedicated supply for the microprocessor controlling volume adjustment, input selection and so on, ensuring no noise from the control section finds its way in to the audio path. Another important part of the noise-reduction here is the fact that the PM-10 is a purely analogue amplifier: many rival designs are today including digital-to-analogue conversion, or adopting digital amplification and volume control, but the Marantz keeps things as clean and simple as possible with its highly-developed all-analogue design. Why? Well, though it may seem convenient to have a DAC in the amplifier, digital circuitry is, by its very nature, noisy (in the electrical sense) and can interfere with the delicate analogue signals passing through the amp. 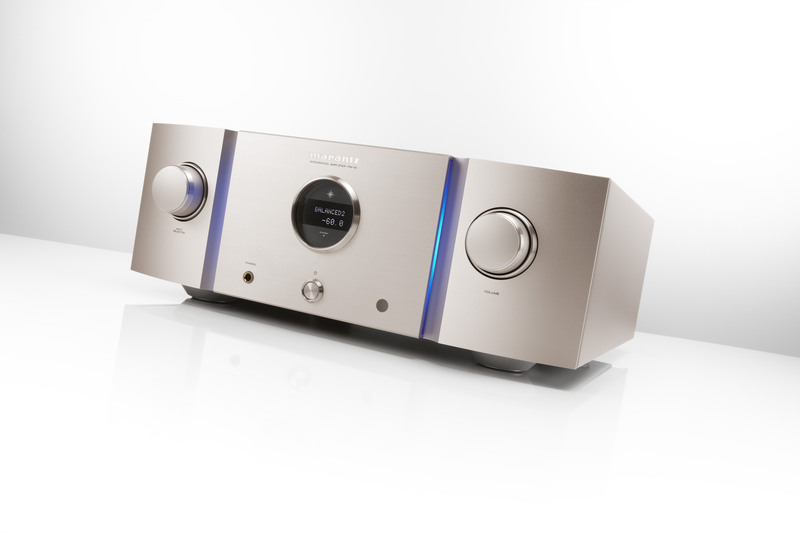 That’s why Marantz chooses to design its Premium Series range with any digital-to-analogue conversion in its Super Audio CD or network music players, keeping its amplifiers as pure and clean as possible. What’s more, to make the most of that purity of design, the PM-10 has also been designed with the option of working in ‘Purest Mode’: when engaged, this deactivates any superfluous circuits, giving the signal the cleanest possible path through the amplifier. There’s also a Power Amp Direct input, taking the signal straight from the input section to the power stage to let the unit work as a pure power amplifier. The benefits of balanced audio layout have long been understood: unlike a conventional layout, one half of the signal path is in the ground plane of either an amplifier or a cable, balanced working uses two conductors or paths – one for positive, the other for negative – and an entirely separate ground to protect them. The benefit in cables is that any external interference will affect both positive and negative conductors, but since the signals they are carrying are the mirror image of each other, they will mutually cancel out any effect – which is why such cables are widely used in pro audio and studio applications, where sources of hum are common, and the longer cable runs involved makes them particularly prone to picking up interference. The same is true when balanced working is applied to audio circuitry: not only does this mirror-imaging of the layout, in which identical components are handling the positive and negative ‘legs’ of the signal, cancel out any potential interference, it also means any noise or errors introduced in the circuitry will also be cancelled out. An additional benefit is that balanced working also uses stronger signals than unbalanced designs, simple because both halves of the circuit are active – rather than just having one half pushing and the other just providing the ground, here we have a ‘push pull’ operation. And a stronger signal means one less susceptible to any outside interference: the more signal there is, the less obvious any noise will be. The PM-10 uses a fully balanced layout, from the input section all the way through to the final power amplifier section: it has two sets of balanced inputs, and also conventional unbalanced line-level inputs (plus a high-quality phono stage), the signal from these inputs being converted to balanced working before being passed through the amplifier. By keeping the signal balanced all the way through the amplifier, and combining that with optimised power supply design, the Marantz engineers are able to achieve maximum noise rejection throughout the audio path, and the highest possible signal purity. For the PM-10, Marantz wanted the purest possible sound, plus the power and dynamics to drive and control some of the world’s most demanding speakers. To achieve this, they continued the balanced working found in the preamp stage right the way through to the power amplifier stage to its speaker outputs, and also adopted bridged working to develop the power required while maintaining that balanced design. This True Balanced Concept realizes a ground-free signal management from the input to the output. What is the bridged amplifier about? In a conventional amplifier, one speaker is driven by the positive and negative part of one single output stage per channel, but a bridged amplifier does things differently, using two separate amplifier stages per channel to drive one speaker. To greatly simplify things: one amp pushes the speaker cones and domes, while the other pulls them back. That much greater control over the way the speaker drive units behave, in that the amplifier can make them start moving, and stop, much more precisely is very important for definition and the ‘speed’ of the system, meaning it can play music with much better rhythmic and spatial controls, not to mention making voices and instruments sound more realistic. In the PM-10, the bridged amplifiers in the power output stage – a total of four amplifier channels – allow this control to be combined with huge power output: it delivers 2x200W into an 8ohm load, and can easily cope with demanding speakers or those whose impedance varies widely with frequency, thanks to a 2x400W output into 4ohms. That ensures not just the power to drive even big, power-hungry speakers to high levels while keeping the sound clean and distortion-free, but also the ‘grip’ to make sure those speakers are doing just what the music demands. It’s all made possible by the use of the latest switching amplifier technology, allowing a compact integrated amplifier design while still fulfilling Marantz performance requirements. Marantz has long built a reputation for choosing the best-possible components for its Premium Series products – and if it can’t find what it wants, it designs and builds the required part. That thinking informed the design of the Hyper Dynamic Amplifier Module (or HDAM): unhappy with the audio quality available from ‘amplifier on a chip’ IC components, the company designed its own alternative, in the form of a miniature amplifier module built entirely of discrete components. 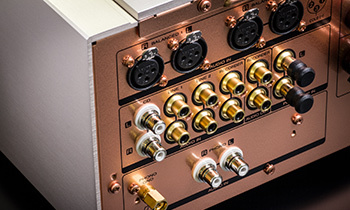 As with all such design decisions, the engineers selected and optimised the HDAM through extensive listening in dedicated Marantz facilities in Europe and Japan, and since it was introduced this component has both been developed and also found its way into an ever-wider range of products. In the PM-10, the latest-generation HDAM SA3 is used, as part of a current feedback topology designed for the widest possible frequency and dynamic ranges – just the thing for today’s ultra-high-resolution audio formats – and aided by ultra-fast custom made block capacitors for the fastest possible response to demands for high current. The same current feedback design is applied to the phono stage in the PM-10, which is configurable for use with either moving coil or moving magnet cartridges for the best possible playback of those favourite LPs. This isn’t a case of Marantz responding to the current ‘vinyl revival’: over the years, while developing and refining its digital competences, the company has remained totally committed to the excellent sound possible from LPs and singles. It has long been fitting its products with high-quality phono stages – even before vinyl came back into fashion! 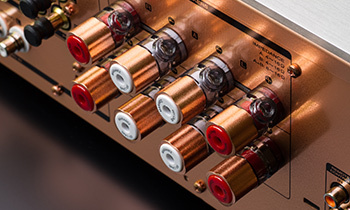 Like the partnering SA-10 Super Audio CD/CD player/DAC, the PM-10 is constructed to the highest possible standards, with a double-layered copper-plated chassis for excellent rejection of mechanical and electrical interference, and casework constructed from thick, heavy, non-magnetic aluminium panels. Both products also sit on aluminium die-cast feet. Even the speaker terminals here are special: even the highest-aiming rivals tend to use components bought in from third party companies, or designed as much for ‘show’ as ‘go’, but the PM-10 has newly-designed and exclusive Marantz SPKT-100+ terminals, made from high-purity solid copper.